RIONEGRO, Colombia— Ninety-five U.S. Air Force Airmen trained with 11 partner nation air forces tallying more than 400 participants in the Colombian-led multinational search and rescue exercise “Angel de los Andes” Sept. 3-14. 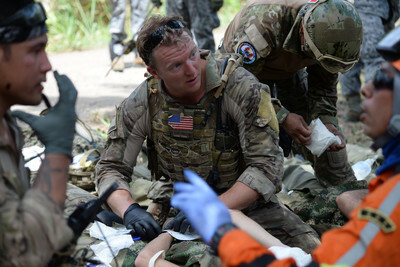 The U.S. and multinational participants trained together by responding to realistic scenarios of natural disaster and combat related search and rescues, humanitarian aid, disaster response, aerial evacuation, patent treatment, flying operations and personnel recovery at Rionegro, Guatape, Velasquez and Palanquero, Colombia. A U.S. Air Force C-17 Globemaster III and a C-130 Hercules transported 506 passengers from all partner nations, moved 86.4 tons of cargo and airdropped 72 multinational personnel total during the exercise, while also transporting simulated victims of the exercise scenarios. The C-130 Hercules airdropped a motorized boat known as rigged alternate method zodiac (RAMZ), an inflatable boat, U.S. pararescuemen and commandos from Colombia, Brazil, Dominican Republic, Panama and Peru in high altitude low opening (HILO) and high altitude high opening (HIHO) free fall jumps. The Colombian Air Force has participated in numerous U.S. Air Force training exercises in the past years to include: Angel Thunder 2014, Green Flag 2016, Mobility Guardian 2017, Red Flag 2012 and 2018. “The significant importance of the U.S. being here is that we have the opportunity to strengthen our relationship so we can be prepared to confront the future threats together,” said Colombian Air Force Chief of Staff Gen. Carlos Eduardo Bueno Vargas. This is the second time the Colombian Air Force has hosted this exercise since 2015. Six nations participated in the exercise and six countries observed. Colombia plans execute Angel de los Andes exercise again in three years. U.S. Air Force participants included exercise planners and leadership form 12th Air Force (Air Forces Southern), pararescuemen from the 48th and 306th Rescue Squadrons, a critical care air transport team from the 943rd Aerospace Medicine Squadron all from Davis-Monthan Air Force Base, Arizona; two aerial evacuation teams from the 109th Aeromedical Evacuation Squadron and C-130 Hercules aircrew from the 133rd Airlift Wing, Minnesota National Guard; a C-17 Globemaster III aircrew from the 14th Airlift Squadron, Joint Base Charleston, North Carolina; and a mobility control team from the 571st Mobility Support Advisory Squadron, Travis Air Force Base, California.